Our handcrafted Cottage Series cupolas are designed to provide the perfect compliment to your storage barn, garden shed, garage or other small structure. Choose from a variety of styles and sizes, then add a cottage sized copper weathervane for the finishing touch. (Weathervanes are optional and not included in the cupola pricing). All cupola bases will accomodate roofs up to an 8-12 pitch. Optional extended bases for steeper roofs are available. 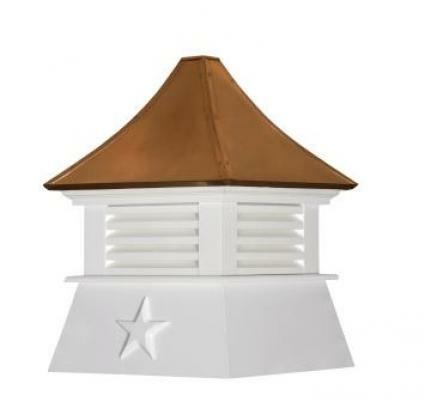 All cupolas are handcrafted using AZEK. Roofs are topped with either 24 gauge copper or black aluminum coil stock. AZEK material is widely known in the building industry as an extremely beautiful and durable product. Azek products have the look, feel and sound of premium lumber without any of the maintenance issues associated with wood products. Azek resists moisture and insects, and will not rot, cup or decay. Azek does not need paint for protection, however it does have excellent paint adhesion and can be painted to achieve a custom color. Our Azek products are assembled with stainless steel fasteners that will not rot or decay.